The Zodiac is the name of the virtual belt in which the planets, Sun, and Moon appear to move about the sky. In reality, the planets and their respective moons (most of them anyway) orbit the Sun about the same plane. Because the orbits of the planets are not on a perfect plane, the Zodiac band is 16° wide - 8° on either side of the ecliptic. When mentioning the Zodiac, the subject of Astrology also comes to mind. Astronomy and Astrology are not the same thing. Astronomy is a science while Astrology is not. The pseudo-science of Astrology plot the positions of the Sun and planets about 12 constellations that constitute the Zodiac. The result of these positions is the effect the given planet, Sun or Moon on your birth sign. There are two problems regarding this plot: there are 13 constellations in the Zodiac and the position of the Sun within the Zodiac was plotted 2000 years ago. 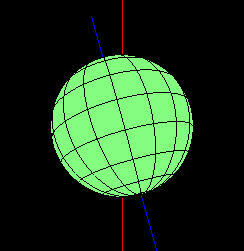 Because the Earth in inclined by 23.45 degrees, it rotates like a top. This is called precession. Precession is the act of a planet spinning like a top. Click on the image to view a demonstration of precession. Because our planet Earth is tilted by 23.45 degrees, it also precesses. The result will be a shift in the position of the constellations relative to us on Earth (video care of Swinburne Astronomy Online). The result is shifting of the constellations. This means that the Astrological plots and predictions based on your birth sign are really off by one month. For example, I was born in early March so my Astrological birth sign is Pisces. In reality however my birth sign is Aquarius since the Sun was in this constellation when I was born. Of course, I do not believe in the predictions of Astrology simply because the other eight planets have no affect on life here on Earth. If this were so, then the orbital speed of the Earth will gradually decrease since the more massive planets orbit the Sun slower than the Earth. This is simply not the case. However, it should be noted that the Sun and Moon do in fact influence Earth in a number of ways to include weather and tidal changes. As far as personality, wealth, health and relationships, there is no scientific evidence to prove these effects. For a comparison to the current dates of the Zodiac versus the Astrology plots, click here to view the table at the bottom of this page. In Greek mythology, Aquarius (also known as Ganymede in Roman myth) was a beautiful young boy whom Zeus brought to Olympus to be the cup bearer of the Gods. It is suggested that Zeus fell in love with Aquarius. Aries Ram or Golden Fleece. In Greek mythology, the ram carried Athamas's son Phrixux and daughter Helle to Colchis to escape Ino. When the ram reached Colchis, Phrixux sacrificed the ram and hung its fleece in the Grove or Ares. This fleece turned to gold and later was the quest of Jason and the Argonauts. The constellation name was common in Greek, Babylonian and Egyptian cultures. Juno sent a crab to defeat Hercules while fighting Hydra. The crab was crushed by Hercules. Also known as Amalthea who provided for baby Zeus after Rhea saved him from Cronos. The word "cornucopia" comes from the broken horn of Capricorn - or the "horn of plenty." The two bright stars - Castor and Pollux - are also the brothers' names. They were the brothers of Helen of Troy. They are also the protectors of ships and sailors. Prehistoric constellation associated with royalty. In Egyptian mythology, it represents the life giving floods since the Sun was in this constellation during the heavy rains. In Greek mythology, Leo represents the Nemean Lion which was killed by Hercules. The only "non-living" object in the Zodiac. Romans chopped claws from Scorpio during Autumn Equinox to make Libra. In Greek mythology, Libra is the scaled held by Astraea that represents justice. While not an Astrological sign, Sun spends longer time here than in Scorpio. In Greek mythology, Ophiuchus is a legendary physician who tried to become immortal to avoid death. Zeus killed him with a bolt of lightening, but honored him because of good works. Venus and her son Cupid escaped Typhon as two fish tied together. In Greek mythology, they are Aphrodite and Eros. A Chiron, half-man half-horse, sent to kill the scorpion (Scorpio). In Babylonian mythology, this represents the demon Pabilsaq. Sent by Gaia to kill Orion when he said he would kill all animals. It is also said that Apollo sent the scorpion to kill Orion. Orion and Scorpio are on opposite sides of the sky. Jupiter turns into bull to carry off Europa - daughter of King of Crete. It is also said that Zeus brought the ram to try and win the heart of Europa. Goddess of farms and harvest. Virgo could also represent Ishtar, Isis, Demeter, Cybele, and Athena. Also thought to represent Astraea, the daughter of Zeus representing justice. It is also suggested that Virgo represents Persephone, queen of the underworld. Notice how the Sun spends more time in Ophiuchus than in Scorpio yet Ophiuchus is not included in the Astrology charts. ©2004 - 2013 Astronomy Online. All rights reserved. Contact Us. Legal. The works within is licensed under a Creative Commons Attribution-ShareAlike 3.0 Unported License.